Members and staff of the Southern Regional Assembly at Connect Centre headquarters in Trinity College Dublin. The CONNECT Centre for Future Networks and Communications at Trinity College Dublin has hosted a study visit by members and staff of the Southern Regional Assembly (SRA). The group included almost two dozen city and county councillors from local authorities across the region. Professor Linda Doyle, Director of CONNECT, gave an overview of the Centre’s research activities during the visit. Cllr Damien Geoghegan, Cathaoirleach of the Southern Regional Assembly, led the delegation and commended the work of the Connect Centre saying: “The calibre of researchers working with Connect across the Southern and Eastern programme area is a testament to the region and Ireland’s standing in the international research community. 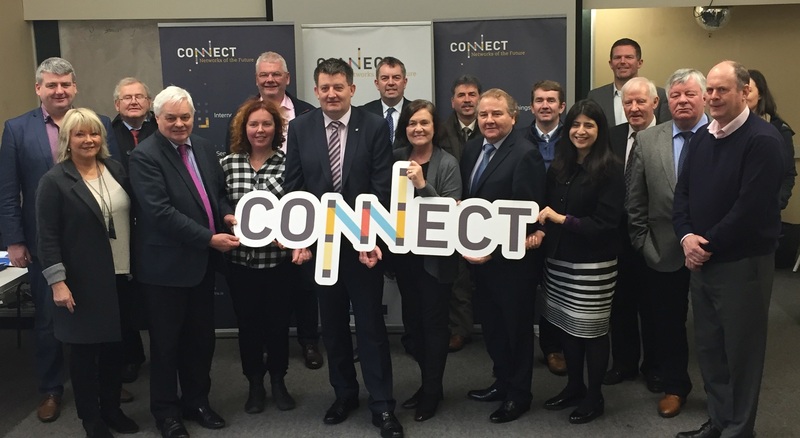 The funding awards attracted by the Centre, and the industry partnerships they have forged, are evidence that Connect – and Ireland – is emerging as a world class location for future networks and communications”. The Southern Regional Assembly is the managing authority for the Southern and Eastern Regional Programme 2014-2020. Science Foundation Ireland’s Research Centres Programme, which supports Connect, is co-funded by the European Regional Development Fund (ERDF) under this regional programme.